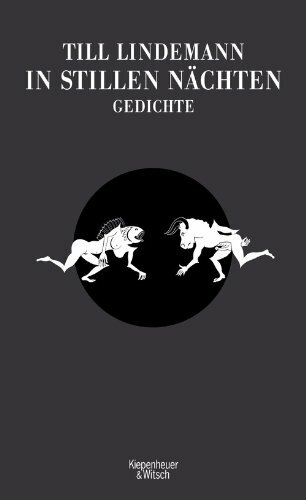 In stillen Nächten: Gedichte - New Till's book? Poems by Till Lindemann, the singer of the band "Rammstein" Till Lindemann is known primarily as a singer (and writer) of the band "Rammstein". Less well known is that he matter for over 20 years, writes poetry - poetry, although some of them have become songs, but as poems have their very own life. Most amazing sound this coming so often almost casually, but rhythmically and musically while carefully constructed texts in which a cryptic, irritable, vulnerable lyrical I in an intimate dialogue occurs with the reader. As the editor writes Alexander Gorkov - - including poems that are "sound like on cold nights scraped from the ice," but even those with nostalgia, longing and intimacy of feeling. Despite the contemporary sound to provide immediate associations with the poetry of German Romanticism and Expressionism one, also to Gottfried Benn and Bertolt Brecht. The themes revolve around the abyss of existence, the hunger of desire, the body, the pain, the pleasure, the comedy and tragedy of communication, loneliness and violence. Edited and with an introduction by Alexander Gorkov, the band, the reporter received the German award for his great report on the U.S. tour of "Rammstein" the magazine of the Süddeutsche Zeitung, 2012. The strip is in addition to the poems as illustrations of a series of black and white drawings by the artist Matthias Matthies. Last edited by Maya; 05-22-2013, 03:56 PM. ^ It's a good one. It will be published in 2.Oktober, but already now it is in Amazon ! Can't wait! I'll hope I can buy one, because 'Messer' I don't have. Oh, that's great news! Thank you, The Rose. Thanks for the link, Snake. Today Rammstein.de posted about the book, The news: it will be available in the Rammstein Shop (16.99€), and the preview of three illustrations by Mathias Mathies. Till Lindemann has written poems for over 20 years, of which only a few have become Rammstein songs. Following “Messer,” Till’s second book of poetry “In stillen Nächten” comes out on October 2nd. “In stillen Nächten” includes poems that, according to the book’s introduction, “sound like they were scraped from the ice on cold nights,” as well as others filled with nostalgia, longing and a sense of intimacy. The book features illustrations by artist and photographer Matthias Matthies.